Remote controlled RGB LED controller for use with our 12V RGB flexible LED strip lighting . Select single colours, control the brightness and includes preset sequences. A remote control and receiver to operate 12V RGB (colour changing) LED. Suitable for use with our RGB flexible LED lighting. 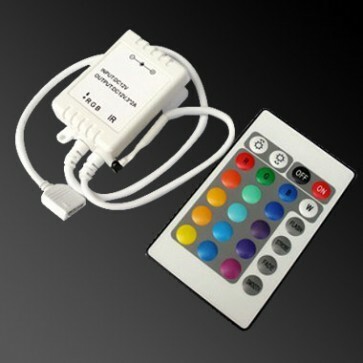 Just connect a 12V supply to the input side of the unit and connect your RGB flexible strip to the output of the unit and the remote control can then be used to change colours to one of 16 set colours, dim the lighting, turn the lights on or off and also can select one of the 4 preset programes. Maximum output current - 2A per channel. If purchased along with our RGB LED strip (either our 30-LED/m or 60-LED/m), the control unit will be wired to the end of the LED strip. Also available in 24V version, please contact for details.